Find the best cleaning supplies to keep your wheels looking shiny and new. Whether you realize it or not, your wheels are one of the first things people notice on your vehicle. Regardless of if you roll with your stock wheels or a set of flashy, aftermarket wheels, it’s important to make sure they always look good. Keeping your wheels looking new isn’t hard – all you have to do is wash them regularly. The benefits of cleaning your wheels are simple, but impactful. Since they are usually the shiniest part of your vehicle, your wheels stand out when they are clean, and provide an overall improvement on the appearance of your car. Most of the dirt on your wheels is from brake dust, which can corrode and permanently damage the wheel finish. By keeping them clean, you protect your finish and help retain your vehicle’s resale value. So, not only do clean wheels keep your ride looking fresh, but they save you money on detailers down the road. Before you jump right into cleaning your wheels, first consider the material or finish of the metal. Certain finishes, like clear-coat, require a more sensitive soap than metal-finish wheels. If you’re unsure of what yours are, it’s always a safe bet to use soap for clear-coated wheels. Here, we explain what supplies you need and the steps for how to clean your wheels at home. Add all of your water, brushes, soap, etc. to your bucket. Use the hose to rinse off your wheels, wheel wells and tires to remove as much dirt as possible upfront. Apply your wheel soap on the inside and outside of the wheel, and let it sit for a few minutes, to break down grime. 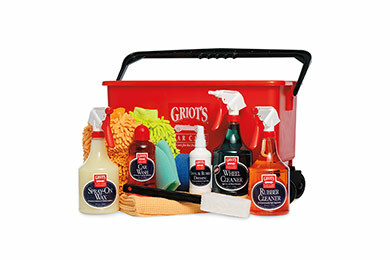 A great chrome wheel cleaner to use is Griot’s Garage Wheel Cleaner. While the wheel soap is working, apply your desired tire/wheel well cleaner, and clean them right away with your brush or sponge. With the wheel soap still sitting, use your brush to scrub the inner area of your wheels, including the back of the spokes. 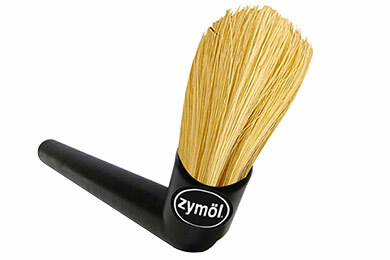 To easily access the backside, it helps to bend the brush at a 90-degree angle. Before putting your brushes/sponges back in the bucket, rinse them off with a hose or in a separate water bucket so your clean soap bucket doesn’t get contaminated. Finally, use your wash mitt and hose to thoroughly clean the soap off of the face of the wheel (including the lug nuts and center cap). Repeat these steps on the other side of the car. Once all of your wheels are clean, wash and dry your vehicle, completely. If there are still spots on your wheels, now is the time to polish them. Polishing rims is easy to do by hand or with a polishing machine. If you have clear-coated wheels, don’t use a metal polish. It is always safer to use a clear-coat safe polish, no matter what kind of wheels you have. To keep your wheels looking clean for months, apply your wheel wax for a finished look. To complete the wheels, apply your wheel well dressing. Be sure not to over-spray onto painted surfaces, for the dressing could damage your paint. Last but not least, apply your favorite tire dressing evenly on your whole tire (you will have to move the car to reach the part resting on the ground). For regular cleanings, you just need to wash the wheel face. Polish and dressing application can be done every few months. As you can see, cleaning aluminum wheels is an easy task. By spending just a few extra minutes on your wheels when washing your vehicle, you get results that mean you may never have to visit a professional detailer again. 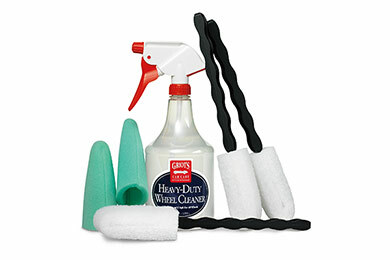 With our easy-to-use supplies, like Sonax wheel cleaner, the hard part is taken care of for you. To find the best wheel cleaner for your needs, be sure to check out our customer reviews. Reference # 762-658-117 © 2000-2019 AutoAnything, Inc.